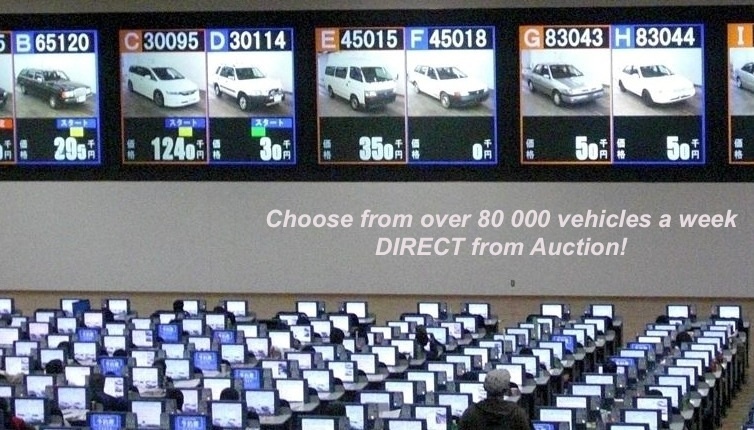 If you can’t find the vehicle you want in our stock, you can search for your vehicle through the Japanese Wholesale Vehicle Auctions, including USS AUCTIONS. There are so many vehicles in the Japanese auto auctions, we can almost guarantee we can find you the car specification you are looking for. We offer access to Japan-wide auctions (107 Auctions) and can arrange for inspections on all target units before the auction commences. Sometimes, our inspectors can call you from right beside the car. We offer a ‘seamless purchasing experience’. We can handle all aspects of your vehicle/s, from auction bidding, inspection, through to shipping to your country, by container or RO/RO. 1. Search vehicle you want at auction. This is now a paid service, please contact us for details. The auction site will open in a new window. You can use this site to check for your target vehicles. 2. We will check you have entered the detail correctly and ok you from the back end – this may take a few hours so please be patient. If you are interested a particular vehicle, please contact us via email with the auction ID number of the vehicle/s you are interested in and your contact details (We prefer Skype or phone). The auction ID number is located at the left of the page e.g., TK569945, YK43234 etc. We will call you ASAP with a auction sheet translation and expected market price for that particular car. To proceed with bidding, we will require deposit. If your bid budget is under ¥1,000,000 we will require a ¥200,000 deposit. If your bid budget is ¥1,000,001 deposit will be negotiable. We accept payment via bank T/T transfer. When we confirm your deposit has been received, you will be eligible for full access and biding privileges on any vehicle. Once we have covered the above, and have discussed a specific target coming up at auction we go to the next stage – inspection of your car direct from the auction. In most instances we can call you from right beside the car and discuss the quality and defects if any. We take pride on full discloser in-order for you to make the right decision when coming to your bid amount. We will advise you of a recommended price, it will be your decision on the final bid amount. After we know the result of auction, we will inform you. If we have won the car we require transfer of the balance within 48 hours (or 2 business days) of the purchase in Japan. We understand some banks may take longer for a transfer to land in japan. A TT copy is sufficient for proof of payment until payment has been confirmed in Japan (Usually 5 business days maximum if payment has been made within 48 hours). Just ask as about your Country. After we confirm your remittance, we can begin export procedure for your vehicle. After the car has been shipped we will provide you with all the documents required to import your vehicle including the Bill of Lading(B/L), Japanese Export Certificate and a original Invoice. We send these directly to you by EMS/DHL/etc.